← A book that explains a lot..
Oh, where do I begin?…my first memories of this fantastic confection come from the boxes at my local HoJo’s. There was an octopus and guy in a diving suit on the front. The variety of bright colors was tempting, and you just had to get mom to pick up a box on the way out the door. Sure, the wax paper stuck to the candy and the taffy was rock hard, but hey, it was chewy once you sucked on it for about 5 minutes. Grocery stores offered the same type of Salt Water taffy in the bulk bins; hard and stale. I thought that’s how it was supposed to be…. Later I discovered fresh salt water taffy at a real candy store, Candy Manor, on Cape Cod. www.candymanor.com This stuff was soft and chewy and came in so many flavors; watermelon, orange sherbet, chocolate, yes even black licorice. 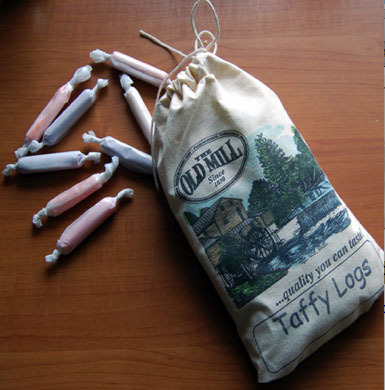 Another recent taffy find is The Old Mill in Pigeon forge, TN. Their taffy comes in 2″ logs that are about a quarter inch thick. It’s really soft and the flavors are exceptional. Check it out at www.old-mill.com/product/1063/30. You will be hooked with the first chew, and you’ll never eat the stuff in the bulk bins again.